U.S. grounds Boeing 737 MAX jets. President Trump said the Federal Aviation Administration would ground Boeing’s fleet of 737 MAX airliners in a major safety setback for the U.S. plane maker. Mr. Trump said domestic airlines would be stopped from using the plane in U.S. airspace after two high-profile crashes of 737 MAX planes within less than five months. Boeing tries to limit the fallout. It isn’t clear how the crashes will affect the more than 5,000 orders for the jetliner. But as airlines and air-safety officials around the world ground the bulk of that fleet and ask Boeing to address the plane’s potential safety problems, the company faces the task of keeping a major engine of the U.S. economy on track. Democrat Beto O’Rourke announces his candidacy for president. The former Texas Republican made the announcement this morning as he aims to parlay his turn as one of the new Democratic stars of the 2018 midterm elections into a run at his party’s nomination. Manafort sentenced again and receives additional charges. Paul Manafort was sentenced to an additional 43 months in prison, leaving the former Trump campaign chief looking at a total of more than seven years behind bars. He also faces charges in New York in what appears to be an attempt to ensure he faces prison time, even if Mr. Trump pardons his federal crimes. SoftBank nears deal to invest in Uber's self-driving unit. SoftBank’s Vision Fund and other investors, including at least one unnamed auto maker, may invest $1 billion or more in the unit with a valuation of between $5 billion and $10 billion. The move would help the ride-hailing firm make its pitch to investors ahead of its eagerly anticipated IPO. U.K. lawmakers rule out any no-deal Brexit. Members of Parliament unexpectedly ruled out a no-deal exit from the EU, likely eliminating the prospect of a chaotic U.K. departure from the bloc that businesses depicted as a worst-case scenario for the country’s economy. Now, options other than British Prime Minister Theresa May's deal become more likely, including an exit agreement with much closer ties to the EU than Mrs. May wanted, and a second referendum on Brexit. Senate to rebuke Trump on the border wall. The chamber's move to pass a resolution rejecting President Trump's border declaration would set the stage for Mr. Trump’s first veto, highlighting the depth of Republicans’ unease over his recent action. Congress isn’t expected to override his veto, which would require a two-thirds majority in each chamber. Elon Musk set to unveil a new Tesla for the masses. Days after cutting the price of Tesla’s Model 3 sedan to reach mainstream buyers, the billionaire entrepreneur is expected to unveil the Model Y compact sport-utility vehicle later tonight. How the college admissions scam unraveled. The investigation, Operation Varsity Blues, ensnared families in the highest economic echelons, accusing them of pushing their way ahead of other college applicants with lies, bribes and cheating. At USC, the scandal runs deeper. More than a mere coach cashing in, the FBI affidavit outlines far more systemic fraud at the University of Southern California, where alleged bribes became a form of athletics fundraising. An idiot's guide to bribing and cheating your way into college. The Journal's Jason Gay asks: Has there ever been a more exquisite snapshot of contemporary American privilege than this week’s news of the federal prosecution into cheating and bribery in college admissions? To fend off Amazon, Walmart turns to food delivery. The retail giant is trying to keep its grip on grocery sales, in part by offering delivery of online orders, but expanding the service has come with challenges. China is gaining on the U.S. in highly cited AI research. A new report found that China is drawing close to the U.S. in the number of its AI research papers that are among the top 10% most cited, a measure of the highest-impact research. About 47% of those papers came from the U.S. in 1982 compared with 29% now, while China’s share has risen to more than 26%. Scientists call for a moratorium to block gene-edited babies. An international group of researchers said world-wide action would prevent irresponsible use of the technology before it causes irreversible changes, especially after a researcher in China last year announced he had produced the first genetically modified babies. 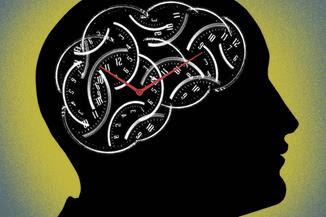 Unlocking the secrets of memory and time in the brain. Our bodies know when to fall asleep and when to wake up. Our brains can keep track of short bursts of time. But in our memories, our sense of time is fuzzy. Now, new research uncovers how we put our memories in order. GOP plans to outreach to women. After an election that left the House of Representatives with nearly seven times more Democratic women than GOP women, Republicans on and off Capitol Hill vowed to even out those numbers. But boosting GOP female recruitment for the 2020 election cycle is proving to be an uphill climb, according to lawmakers and GOP officials. After several school shootings, President George H.W. Bush halted the import of semi-automatic rifles. The ban didn't apply to a large number of similar weapons manufactured domestically, and it didn't affect foreign-made semi-automatic weapons in the U.S. already. 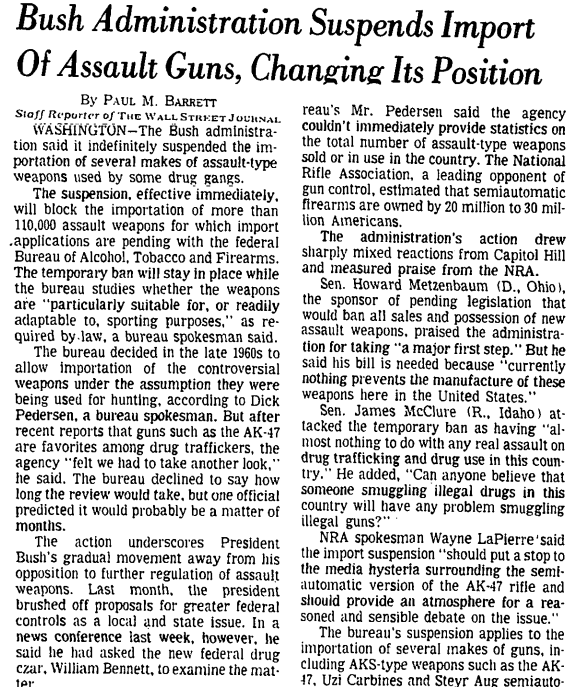 Bush would go on to make the ban permanent in 1989, and Congress would take up the issue four years later with the now-expired Federal Assault Weapons Ban of 1994.